Getting fired up to blast another post with a new game in mind! BOOM! Bomberman is another NES game I’ve played when I was young. Who would’ve thought I could remember these kinds of games? Or should I ask, How can I forget these games? 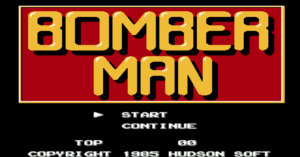 It’s a popular arcade strategic game in the early years that even my dad played Bomberman in his spare time. I’d like to start by saying how good it is to be born in the era of classic video games… not the times when Atari or other relative consoles were at their prime (I haven’t seen one personally). The games were a little updated and I can say “modern”- anyway, this post is about Bomberman. The game is played with 1 player only, the objective is pretty simple, kill all enemies and find the door to go in and complete the stage, but before that, it’s advantageous to find items that can power up your character, these items are hidden in soft blocks which can be destroyed by placing a bomb and waiting for it to explode, be careful though, the bomb’s blast can destroy the upgrade item. Controls are pretty simple, D-pad is for navigating the white bomber through the maze, A is for placing bombs that destroy the soft blocks and killing enemies and B is for detonating the bombs with a remote controller (which can be acquired in stage 14, I guess). It makes the game easy especially when you acquire the controller item, because you don’t need to wait when the bomb will explode and it also gives you time to hide from the blast. And lastly, there’s an item that renders you invulnerable from the blast of your bombs (making the game more easier to beat) but can still be killed by enemies when touched. Once the game is completed, spoiler alert: the white Bomberman becomes human and changes into another character (Lode Runner another NES game), I guess it had a simple story where he needs to escape those stages by going through the doors and become free. This game brings a smile on your face because of it’s simplicity. And thus concludes my post about this game and the white bomber.